Filmmakers and researchers alike have been exploring the skewed reality of social media’s guise since the inevitable rise of Facebook. 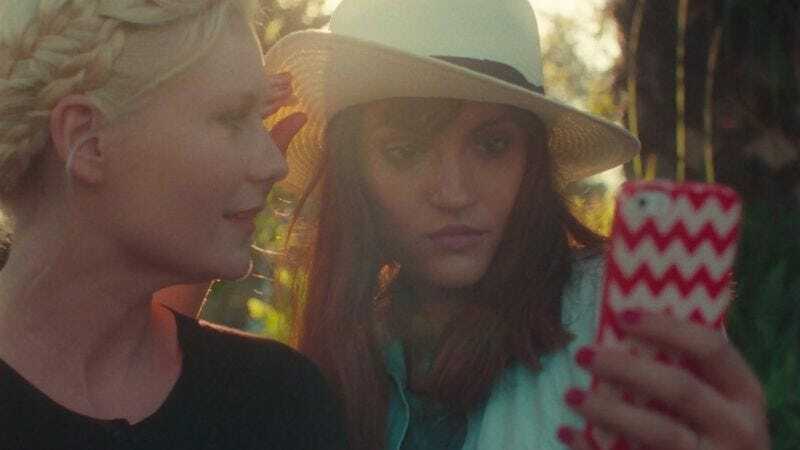 One of the latest is Matthew Frost, whose Aspirational short features Kirsten Dunst as something of a drive-by selfie victim. As the actress patiently await a driver, two girls stop to take multiple selfies with her (instead of one simply photographing the other) without as much as a “Hi, how are you?” In fact, the only questions the girls ask are “Are you Kirsten Dunst?” and “Can you tag me?” It’s a beautiful portrayal of everything that’s wrong with everything. Frost also featured Lizzy Caplan in his take on the painfully manufactured whimsy of indie clichés in last year’s Fashion Film. ASPIRATIONAL from Matthew Frost on Vimeo.